Tiles are flat or curved pieces of fired clay, stone, concrete, pottery, cement concrete or terrazzo. They are built up with various thickness and shapes ranging from square, polygonal etc. Precast terrazzo tiles are also defined as mosaic tiles. Once the mosaic tiles are placed they should be polished properly. White glazed tiles are produced from pottery clay and utilized for flooring, W.C, bathrooms, swimming pools and other sanitary blocks. No polishing is required for these types of tiles. For tiled flooring, rigid sub-grade is needed in the type of RCC slab or cement concrete. 1. Tile floors are non-penetrable. 2. Tiles floors are extremely long-lasting, hard and uncrackable. 4. It has gracious appearance. 5. It can be easily set up. 6. Less maintenance is needed for floor tile. 7. Maintenance can be done simply. 8. Repairing can be done easily. 2. It becomes slippery after getting wet. It is a standard type of flooring and normally applied in areas of worship (temples, churches, mosques etc) and in public buildings with rich specifications. Marbles are placed in floors just like other tile floors. The electronic polishing machine is used to polish the surface off the floor. The surface of the floor after polishing is very attractive and smooth. The size of marble slabs should be utilized in flooring based on the acceptable pattern. The slabs for general works are available in square or rectangular in shape and their thickness differs from 20 mm to 40 mm. The flooring is set on prepared sub-grade of concrete or RCC slab. As marble flooring is not cost-effective, it is not applied to the areas like kitchen, bathroom entrance etc in residential building. 1. Marble flooring lasts for a long time. It is a heavy stone and it has ability to bear heavy loads on it. 2. It comes with a very smooth finish and after being polished, it offers a glowing shine. 3. It has good resistance capacity against scratch and fire. 4. The cleaning process is very simple for marble flooring. 5. It is totally environment friendly. 1. 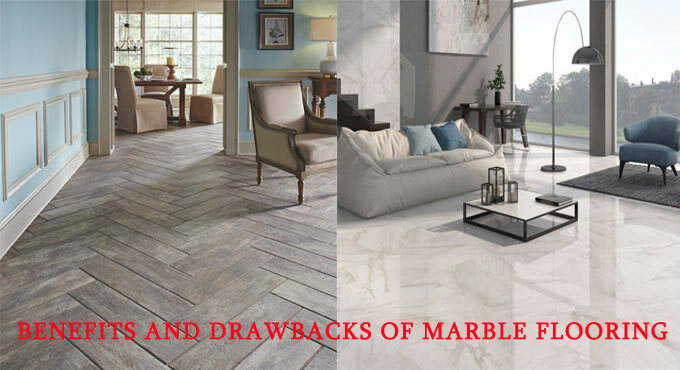 Inserting marbles in floors is very much time consuming hence require only The skilled technicians and laborers are required for setting up marble flooring since adding marbles in floors is very time consuming and laborious. 2. After being set up, the task becomes very critical to change or replace the marbles. 3. It needs adequate maintenance work. 4. The marble floors become very slippery when they are wet. 5. Since marbles become very cold in winter season, they should not be used in very cold climate. 6. Marbles are much heavier as compared to other tiles. More labors are necessary for loading.